1. It’s a festival within a festival, so you get twice the festival for once the ticket price. 2. Whether you love Grant Denyer, hate Grant Denyer or are merely indifferent to Grant Denyer, we’ve some jokes for you! 3. There’s a raffle every night! You could win a fabulous prize of some sort! 5. We’ve made a show that’s bursting with big characters and absurd sketches, but it’s got a toasty nugget of heart at its centre, and we think you’ll love it as much as we do. We’ve had a wonderful Melbourne Fringe Festival which was full of all things creative and wacky including, a show in a car (Equal Best Performance Winner: Dion), a shop window (Winner of Best Ideas and Words Award: Between Two Lines) and one in a huge space with only two audience members (Equal Best Performance Winner: Blindspot). We here at Squirrel Comedy are mostly interested in Comedy. That’s not to say that we didn’t see funny shows in other catagories or that there were some rather unfunny shows that found their way into the Comedy section, but, hey this is Melbourne Fringe and it’s all about mixing it up and taking risks. 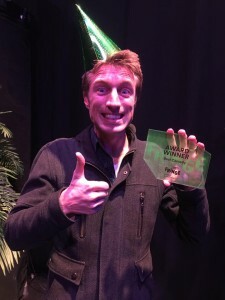 Congratulations must first go to Best Comedy winner Sammy J who has created his Opus Magnus in Hero Complex. A work that had everyone who headed out to the Northcote Town Hall to see it howling with laughter, cheering and crying with pure joy. I saw a lot of great shows at the festival but could not imagine any I missed were better than this – in any category – and couldn’t be happier with its Best Comedy Award win. An autobiographical show with a sprinkling of his brilliant comedy songs and a lot of surprises that must be kept secret, making it difficult to review. Except to say that it is a celebration of unpopular nerdy passions, in this case comic book hero The Phantom, but of course it’s about much, much more. Look out for it at Melbourne International Comedy Festival and other Festivals no doubt, just don’t miss it. Winner of the Queensland Tour Ready Award was another stunning autobiographical comedy; Isamofarcist by Sami Shah who’s come to Melbourne from Afghanistan via studying in the USA and living in Western Australia. Sami has been doing excellent stand up around Melbourne for the past year about religion, politics and other dangerous ideas in a very accessible, warm and hilarious way. A comedian who’s definitely worth going out of your way to see if you like your comedy smart. Queenslanders can look forward to seeing Isamofarcist next. 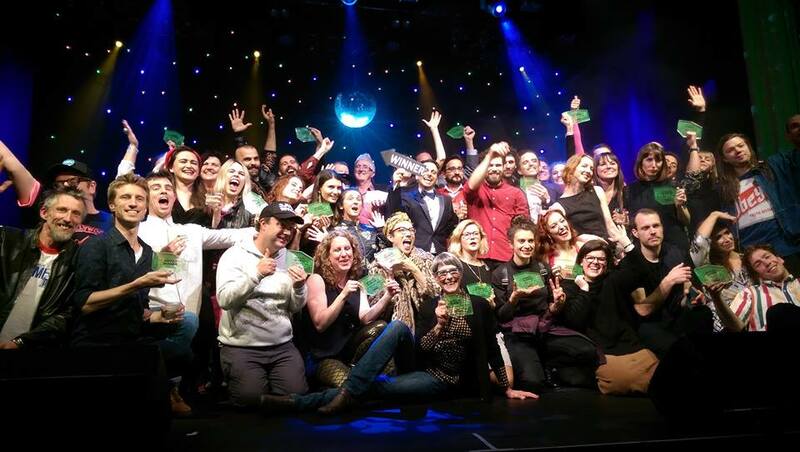 More congratulations to one of the hot tickets at this year’s Melbourne Fringe Andre Tonight! by Chris Ryan and special secret guests that had everyone whispering that this was a must see. It won The Discovery Award and was a discovery to everyone who managed to get seats in the Rehearsal room (now with raked seating). Chris’s character reminded me of an Epping based Norman Gunston, a beautifully rounded sad sack character with a dream to be a TV Tonight Show host and some of his dreams came true in Andre Tonight! Another show to look forward to when it pops up again. 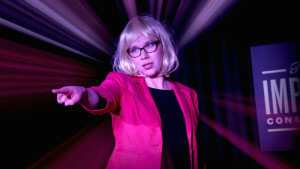 A Squirrel discovery at Melbourne Fringe was another amazingly strong character comedy Cindy Salmon’s Empowerment Hour. The show is a send up of an American “empowering” daytime TV host such as Tyra Banks or Bethenny Frankel (the 2nd rate Oprahs). Hayley Tantau’s, Cindy Salmon is one of the most powerful high status creations on the Australian stage right now. A high status character that can be hilariously satirical, wildly inspiring, teetering on the monstrous and yet somehow sympathetic is rare among current female comedians (I can think of Sarah Ward’s Yanna Alana and Queenie Van de Zandt’s Jan Van de Stool). Hayley pulls it off; sustaining it for a full hour without dropping her perfect American accent once, while keeping the audience on side despite some hilariously appalling behaviour. Go see comedy Cindy Salmon’s Empowerment Hour if it pops up near you and we’ll be keeping an eye on Hayley Tantau. With a blast of an air horn and a shattering of the glass ceiling, Cindy Salmon bursts into Melbourne Fringe with an infectious energy that will leave your cheeks sore by the end of the night. ​Cindy Salmon’s Empowerment Hour​ – a solo vehicle for Hayley Tantau’s answer to Oprah, Cindy Salmon – is an absolutely hilarious character piece, filled with positive messages for women taken to the absolute extreme. In the ​Empowerment Hour, Salmon (Tantau) is running her own daytime talk show, ​Upstream, with the assistance of her mild-mannered tech Jayden (Jayden Masciulli). Over the course of the hour, a personal crisis unfolds, leading Salmon to take matters into her own hands. Things take a turn for the weird and the dark, but true to form, Salmon comes out on top through sheer force of will. Tantau has previously performed as Salmon as part of sketch group Trillcumber, she has got it down perfectly and the character stands up brilliantly in a solo hour. By taking Salmon outside of the comfort of her TV show and showing how she deals with difficulties in her own life, Tantau adds nuance to her portrayal and it makes Salmon’s brashness even funnier. The audience responded well to Salmon’s messages of empowerment, and Tantau was quick-witted in her responses to any audience ad-libs, always coming back with a Salmonism on the fly. Masciulli does a wonderful job on the tech desk, blasting Salmon’s slogans and bursts of air horn with brilliant comedic timing. The outstanding tech, brilliant writing and captivating performance mean that the performance whizzes along, with non stop laughs and the audience breathlessly wondering what will happen next. Cindy Salmon’s Empowerment Hour is a bold and confident first solo show from Tantau. This is one of the best examples of a high status character comedy done to perfection, it is a highlight of Melbourne Fringe and I look forward to seeing what comes next. Trillcumber (Mario Hannah, Hayley Tantau, Simon McCulloch and Ryan Zorzut) return for their second MICF with Paradise – a narrative sketch show that is cleverly conceived and skilfully performed. At the centre of Paradise is Harrison Gregory (played by Zorzut), a crackpot Elon Musk type who has built a rocket that will take passengers to Mars. This trip to Mars works as a framework through which we are introduced to a whole cast of characters in a series of interconnecting sketches, each with their own reasons to give up their lives on Earth and flee to the red planet. 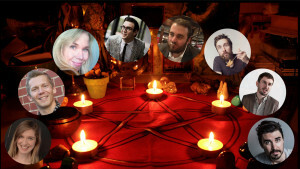 Every member of Trillcumber is given a chance to shine. Hannah’s incredibly boring man Bobby is a delight, and you truly feel for him by the end of the show. Tantau hilariously displays her musical chops as a convicted felon, and is an absolute highlight as a ghost-obsessed girlfriend. McCulloch is fantastically absurd and a little bittersweet as the narrator of the piece. Zorzut makes for a wonderful new addition to the Trillcumber team. His portrayal of Harrison Gregory is pitch-perfect, but it was his ridiculous appearance as a ghost that really got me laughing. It’s a well-rounded cast. Though the overarching concept of jetting off to Mars is a distant fantasy, there is a deeper, more relatable theme of running away from your problems that is thoughtfully played with. Every character has a history to deal with and a lesson to learn. The narrative structure is interesting and shows some growth from Trillcumber as writers. It’s silly sketch that also manages to tug at your heartstrings. Paradise is a terrific follow-up on last year’s debut from Trillcumber. If you’re after well-written sketch comedy from some accomplished young performers, it’s definitely a show worth checking out. For the past few years, The Improv Conspiracy has been establishing itself as the company to see for longform improv. In 3 Mad Rituals, a team of fabulous performers take on a marathon of longform formats, displaying both incredible stamina and a talent for pulling comedy gold from seemingly thin air. 3 Mad Rituals is a 90 minute behemoth of improvised comedy. The players take part in three “rituals” designed by Del Close (a legendary performer and director at Second City) – Deconstruction, The Movie, and The Harold – all working from the one suggestion. In the Improv Conspiracy’s version, the suggestion is taken from a line of poetry called out from the audience. On the night I attended, it was Emily Dickinson’s “Hope is a thing with feathers”. First up is the Deconstruction – a series of short scenes playing off an initial opener. Performers Andrew Strano and Andrew Watt showed that they also had drama chops, starting things with a brutally emotional scene about a father caring for his drug-addicted son while he gets clean. The rest of the crew then skilfully created comedic scenes based on this relationship. Following this was The Movie, in which the team created a half-hour “film”, complete with suggested camera and lighting instructions. From the embers of the preceding half-hour, they created ‘Noah and the Mecha-Angel’, an anime-style take on the biblical story, featuring Hayley Tantau and Mario Hannah as a pair of extremely unproductive water demons, intent on destroying the world but failing to do much about it. Finally was The Harold, a long-form staple of The Improv Conspiracy. Here, things got a little hit and miss. A series of scenes about a murderous husband strayed into uncomfortable territory, with the dark subject matter not getting enough laughs to feel justifiable. However, there were also bright spots. Broni Lisle’s performance as a magician facing discrimination from his community was hilarious, as was Dan Pavatich as the nation of Chad, who inexplicably spoke fluent Japanese. 3 Mad Rituals is a wonderful opportunity to check out some of Improv Conspiracy’s strongest performers testing their skills in a gruelling format. Keeping a captive audience with a 90 minutes show that starts at 10:15pm is a tall order, but the team well and truly accomplished it, keeping the room in stitches for the duration. Trillcumber – Is This Intimacy? Have you ever been the uncomfortable one at a party, standing around the edges, not quite connecting with those around you? If so, this is a show for you. Trillcumber (Simon McCulloch, Hayley Tantau and Mario Hannah) have composed a slick hour of sketch in Is This Intimacy? As well as being terrifically funny, the show explores the awkwardness of relationships in their various forms, from first introductions to fraught romantic entanglements. Trillcumber have created some wonderful characters in this show. Even in the more bizarre sketches, everything has a real, emotional base. You find yourself having sympathy for foxes and rooting for anthropomorphic planets. Tantau’s powerhouse of empowerment, Cindy Salmon, was a stand-out, aurally assaulting the audience with a combination of harsh feminist truths and even harsher air horn. McCulloch and Hannah’s performances as a serious actor and comedian-turned-serious actor starring together in a film were hilarious – a classic clash of drama and absurdity. The sketches in Is This Intimacy? are filled with relationships that occupy a space of slight discomfort. They’re often a step shy from full-on conflict, characters swallowing their issues to keep the peace. Trillcumber deftly mine these social ineptitudes for laughs. The trio does a great job of highlighting how we all share something in feeling like outsiders, without coming across as preachy or smarmy. They have a strong rapport on stage, and their performances feel really natural. 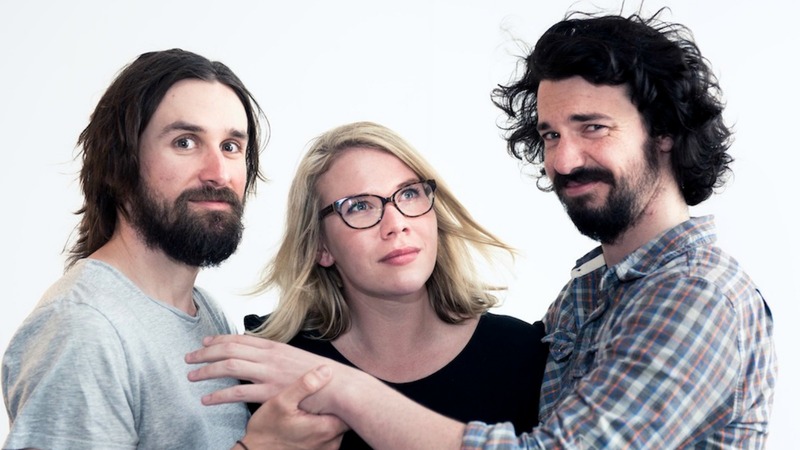 All three performers have previous experience with The Improv Conspiracy, and it shows – Is This Intimacy? is a very confident, polished first show for Trillcumber. There’s great honesty in Is This Intimacy? Trillcumber present gloriously ridiculous scenarios, populated with characters that feel genuine. It’s sketch that brings together humour and heart.